Sonia Gandhi and Mamata Banerjee came face to face at the Central Hall of parliament shortly after Congress leader Adhir Ranjan Chowdhury attacked the Trinamool Congress over the Saradha chit fund case. A furious Mamata Banerjee today refused to calm down when Sonia Gandhi reached out to her after a Congress leader of Bengal attacked her in parliament. "We will remember," declared the Bengal Chief Minister when she encountered Sonia Gandhi, UPA chairperson and former Congress president, later. The two came face to face at the Central Hall of parliament shortly after Adhir Ranjan Chowdhary, Congress's top leader in Bengal, attacked Mamata Banerjee's Trinamool Congress over the Saradha chit fund case in the Lok Sabha. 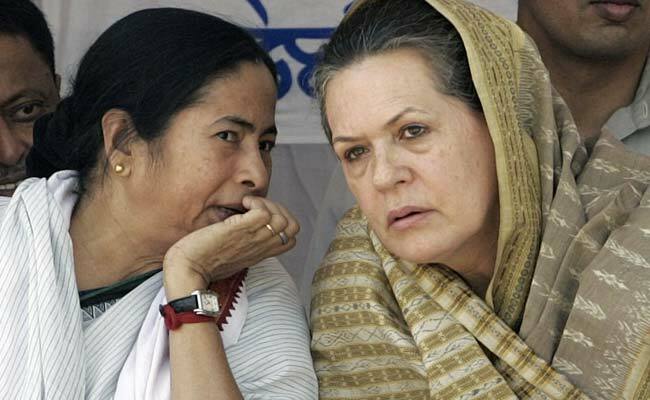 "We are accusing each other but we are friends," Sonia Gandhi said to Mamata Banerjee, drawing a terse response. Later in the day, however, Mamata Banerjee declared at an opposition meet that she would fight alongside the Congress and the Left, her enemies in Bengal, in order to defeat the BJP in the national election. Several members of Bengal's ruling party have been charged or arrested in the Saradha and Rose Valley chit fund cases involving the swindle of crores taken from small investors. The Congress sent its leaders to Mamata Banerjee's opposition unity rally in Kolkata last month. Last night, the Bengal Chief Minister said the questioning of Sonia Gandhi's son-in-law Robert Vadra is "nothing but political vendetta ahead of the Lok Sabha polls". Congress president Rahul Gandhi even walked over and joined a Trinamool Congress protest at parliament. Mamata Banerjee was also asked recently about the Congress's double-speak. "I don't care... it is their internal issue. What happens in states is different," she had said. She made it official today at the opposition rally.